It started as a hit song by ABBA, then it became a musical, and now it’s a phenomenon. MAMMA MIA! first premiered in London and has since been seen by tens of millions of people across the globe. Set on a Greek island, the musical MAMMA MIA! tells the story of Sophie, a bride-to-be who wants nothing more than her unknown father to walk her down the aisle. So, she invites three of her fiercely independent mother’s ex-lovers to her wedding in a move that could make or break her special day. ABBA classics such as ‘Dancing Queen’ and ‘Take a Chance on Me’ are woven into an original narrative that is funny and ironic, occasionally cheeky and unapologetically optimistic. MAMMA MIA! is beloved by the world. With a striking number of audience members seeing it two, three and even four times, at any moment this West End triumph is playing on at least three continents. Now playing at the Novello Theatre in London, there has never been a better time to buy your tickets to this uplifting show. Click here to read five things you never knew about the show! For accessibility information please contact 0344 482 5137. Collect at the box office. 2 hours 35 minutes including one interval. This production contains flashing lights. 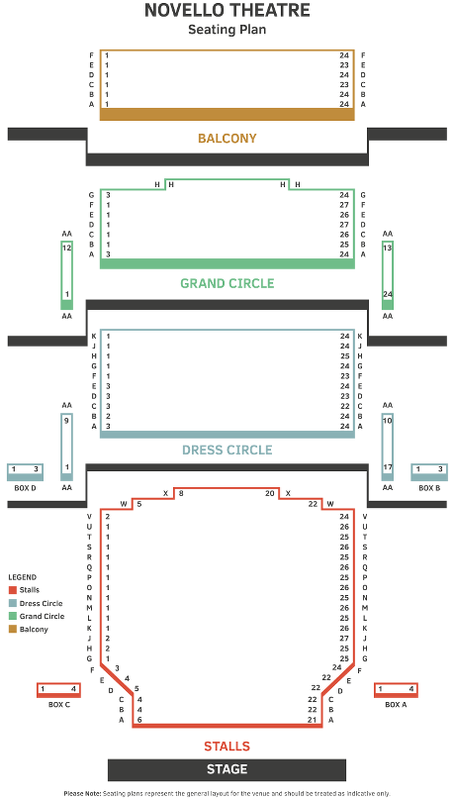 Please note: The seating plans are not accurate representations of the auditorium. While we try to ensure they are as close to the actual theatre plan as possible we cannot guarantee they are a true representation. Customers with specific requirements are advised to discuss these with the theatre prior to booking to avoid any confusion. If you have chosen collect at box office please print the confirmation and bring it on the day, a minimum of 30 minutes before the performance start time. You will also need to present the card used to purchase the tickets as valid ID. If you have chosen to receive tickets by post, the tickets will be despatched approximately 2-3 days after purchase. Early Bird Offer: Book 4 months or more in advance and save £20 on selected tickets for Monday - Thursday performances (subject to availability). Recommended for ages 5 years and above. By Bus: 6, 19, 13 and 77a stop outside the theatre with many more serving the Strand. At its heart it remains an irresistible show, full of punchy and hilariously choreographed production numbers (courtesy Anthony van Laast), that is full of heart. The show treads a fine line between cheeky cheesiness and sincerity, but the cast must provide the latter or the former collapses, too. As the mother and daughter at the centre of its story, Helen Hobson and Charlotte Wakefield anchor it with both. Hobson lends mother Donna a tough, gritty heart, nowhere more so than in the anguished feeling she brings to The Winner Takes It All. Wakefield, who made her West End debut on this same stage in Spring Awakening, is radiantly lovely as daughter Sophie, whose attempt to discover her father’s identity drives her to a bigger discovery of her own. But what is it that makes the show so appealing? Well, quite apart from having some of the finest pop songs ever written, Mamma Mia! is the ultimate feel-good tale of love conquering all. It is completely uncynical and consistently compelling – it's the perfect show for someone who says they don't like theatre, or who "doesn't do musicals".